Frappé was invented in 1957 in Thessaloniki during the International Trade Fair by an employee of the Nestlé company. He wanted to have an instant coffee during his break but couldn't find any hot water. So he used a shaker to mix instant coffee with cold water and ice cubes. This improvised drink turned out to be a success. It is one of the most popular drinks in modern Greece. Greek frappé is typically made with spray-dried instant coffee, sugar, and water. Sometimes milk is added. The beverage can be flavored with liqueurs such as Baileys Irish Cream or Kahlúa. Outside Greece, the espresso version of frappé is popular. In the United States, the term “frappe” can be applied to various iced coffee beverages, either chilled or frozen. 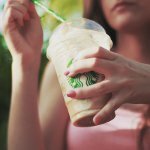 Starbucks has its own trademark for a line of frozen coffee drinks – Frappucino. To celebrate the National Frappé Day, have a nice cup of iced coffee. You can top it with chocolate syrup, whipped cream, or a ball of ice-cream.